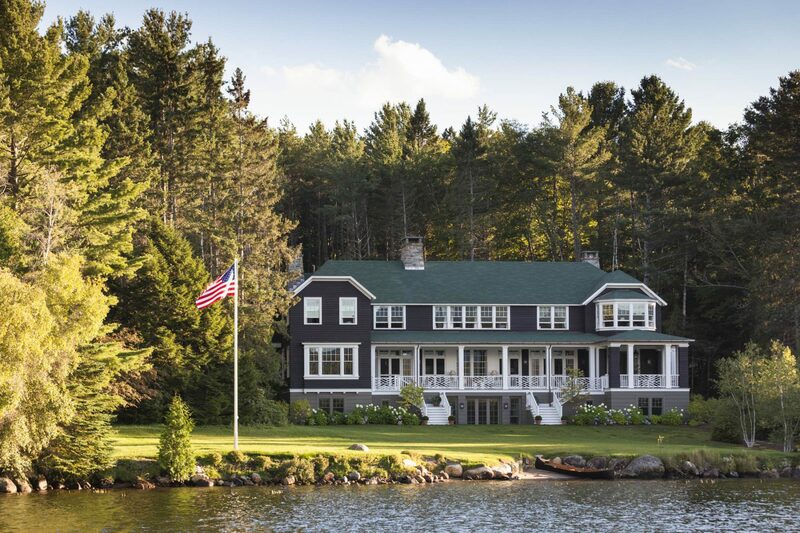 This new 11,000 square foot residence, perched on the shore of Lake Placid in the Adirondacks, was designed for an active family whose lives revolve around the sporting pastimes of this resort community—skiing in the winter months and boating and water sports in the summers. The general character of the house—with its broad, dark brown clapboards, crisp white trim, and green roof shingles—was inspired by the vernacular architecture of the Lake Placid region to seem as though it’s been in the family for generations. A dramatic, winding approach from the top of the property leads down to the house which appears at first glance to be a two-story residence. The third and lower level of the house is visible only from the lakeside and the stunning views of the lake itself are revealed only once you’ve stepped into the broad stair hall entryway from the front door. Once inside, the thinness of the floor plan affords the house a deliberate transparency, so that wherever you are, you have a strong sense of the water and the play of sunlight over the course of the day. A long porch ties together the wings of the house and a large bay window anchors the façade, pushing forward to the edge of the porch to grab as much light as possible in the great room beyond. Another long porch on the lakeside mirrors the entry porch. We balanced the rambling informality of an Adirondack camp with a low-key, subtle but refined classicism in the interiors. Reclaimed oak floorboards in the open public spaces, including a large living room and eat-in kitchen, and painted wood planks in the bedrooms are juxtaposed by more formal throughout the house, such as elegant paneling with a simple inset pattern, in the entry hall.